OPolitical is an app and website platform that aggregates and visualizes the economics of prosthetic use to provide data points for policy-makers, and help them enact better healthcare laws appropriate to the benefits of using advanced microprocessor based prostheses. Insurance companies tend to deny coverage for advanced prostheses by calling them “experimental.” Through visualizations based on real-life data, policies can mandate insurance companies to provide continued coverage for microprocessor based prostheses—including repairs and replacements. While there is power in individual stories to mobilize public support, policy makers rely heavily on data to make policy decisions. 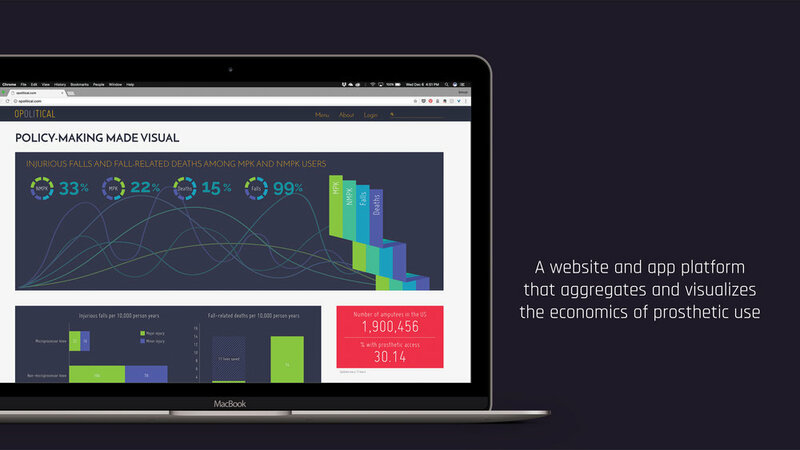 This service aggregates an individual’s data points and presents a collective view using visualizations and can represent various co-relations between different data points. The vision is to help drive policy makers to mandate insurance companies to provide continuous coverage for advanced prosthetics so that people who require these get access to them and can return to becoming productive members of the work-force.